This is an arm bracelet worn by the soothsayer who warns Julius Caesar in William Shakespeare’s play of the same name to “beware the ides of March,” a premonition of Caesar’s death mid-month. The construction of this bracelet required a bit of puzzling out, partly because it needed to be large enough to be seen in detail by the audience. I bought a rubber snake at a toy shop in Stratford, Ontario. I cut its head off and drilled a hole into the head from the neck end. I used hot glue to stick it onto the end of a coiled arm bracelet. I cut a centimetre-wide strip from a thin sheet of aluminum to match the length of the coiled bracelet and drilled pairs of holes at regular intervals along its length. The space between the holes was as wide as the coiled bracelet. 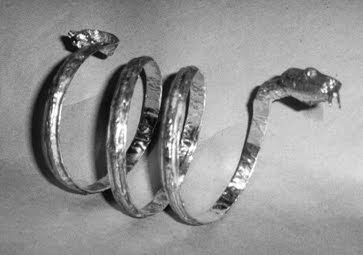 I used thin wire to “sew” the coiled bracelet onto the aluminum to make it more comfortable to wear, stronger and bigger. I then covered the entire project in contact cement and wrapped the bracelet in heavy-duty aluminum foil, burnishing it to show the underneath detail of the rubber snake head and the coil bracelet and give it the appearance shown above.